Greenwich is a maritime town on the south bank of the River Thame. It grew from a village at the gates of the Royal Palace of Placentia. The Palace occupied the site where the Old Royal Naval Collegenow stands and is where Tudor monarchs such as Henry VIII were born. Greenwich Town Centre is a part of a Unesco World Heritage Site which includes Greenwich Park to the south east of the town centre and contains the National Matitime Museum, the Queen’s House and the Royal Observatory. The focal point of Greenwich Town Centre is the covered Greenwich Market which is surrounded on all four sides by terraces of early 19th century buildings. In the middle of each terrace is an access to the market, and on three sides the access is a boutique lined passage. On the third, north side, is the main market entrance. Greenwich Church Street and Nelson Road which enclose the market to the west and south are the main shopping streets in Greenwich and are lined with restaurants, bars and boutiques selling products ranging from ships’ compasses and old maps and books to 1960s pop paraphernalia. 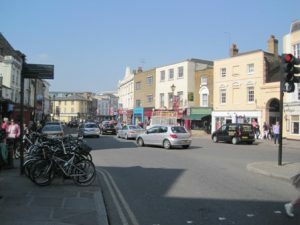 The town centre could be described as quaint were it not for the fact that it is part of one of the main east-west vehicular thoroughfares in this area of London and as a result somewhat congested. At the northern end of Greenwich Church Street facing towards the Cutty Sark is the Gypsy Moth public house which serves food and has a medium sized garden to the rear. Facing onto Nelson Road in the heart of the town centre is the Bar de Musee bar and restaurant, it is renowned for its collection of fine wines and spirits and it has a large garden. The Mitre Inn next to St Alfrege’s Church to the south west serves food and has a conservatory and small garden to the rear. Opposite St Alfrege’s Church a short distance up Stockwell Street and on your left is the Spreadeagle restaurant which serves excellent French food and has a wonderful collection of old paintings of Greenwich. 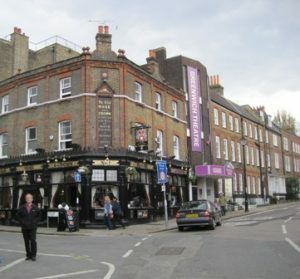 A few metres up the the road at the bottom of Croom’s Hill is the Rose and Crown public house which serves food and nestles in the corner of the building which houses Greenwich Theatre, a local theatre which also hosts touring performances. A few metres further north up Croom’s Hill and to the right is the Fan Museum which traces the history of the fan and serves afternoon tea in an orangery. If you walk to the south west of the town centre past St Alfege Church along Greenwich High Road and toward Greenwich Station, you will come to Royal Hill on your left. 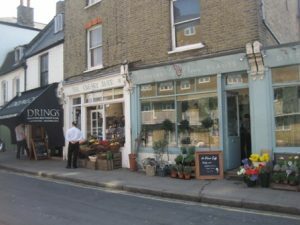 Visiting the shopping parade on Royal Hill is like stepping several decades into the past – there is a greengrocer, a butcher, a tea room, a florist and a cheese shop all of which sell excellent produce. Further up the hill is a comfortable public house called the Richard the First which serves good food and has a large garden to the rear.